AMCHAM advocates for the success of its members as well as provides a powerful platform for lobbying the needs of American businesses within Malaysia. Our activities provide access to top business leaders, government officials, and other senior decision makers in Malaysia and the United States. Providing access to these individuals allows our members to have first hand information on Malaysia’s ever changing business environment, ultimately promoting their success within Malaysia. AMCHAM is an advocate for its members’ interests, representing them at dialogues with the Malaysian and U.S. governments, through industry position papers, and in conjunction with other business organizations. Excellent Networking opportunities AMCHAM is ideally positioned to help members increase their business contacts through informative briefings, industry roundtables, and other networking events. These events provide networking opportunities for our members to ensure the success of their business by building long term contacts within Malaysia. AMCHAM’s committees act as forums for members to discuss common issues. They also provide a platform for members to engage in dialogues with government officials on matters relating directly to their industries. AMCHAM recognizes the importance of reciprocating goodwill and connecting with the local communities. Our Young Enterprise (YE) Program and the Junior Achievement (JA) Program offer excellent, structured workshops for our members to reach out to the communities, such as schools and universities. As these two programs are well regarded by the Malaysian government and media, this is an outstanding way for our members to incorporate a corporate citizenship framework within their companies through AMCHAM’s corporate social responsibility programs. AMCHAM members offer exclusive and confidential business briefings for potential investors looking to Malaysia as the preferred destination to expand or relocate their business. Our website offers opportunities for members to profile their companies to the other members as well as the wider public. It incorporates the latest developments and issues pertaining to the economy and business matters. The AMCHAM website also showcases the latest upcoming events as well as CSR programs by U.S. companies based in Malaysia. Join AMCHAM Malaysia Today To Enhance Your Business Value Proposition! 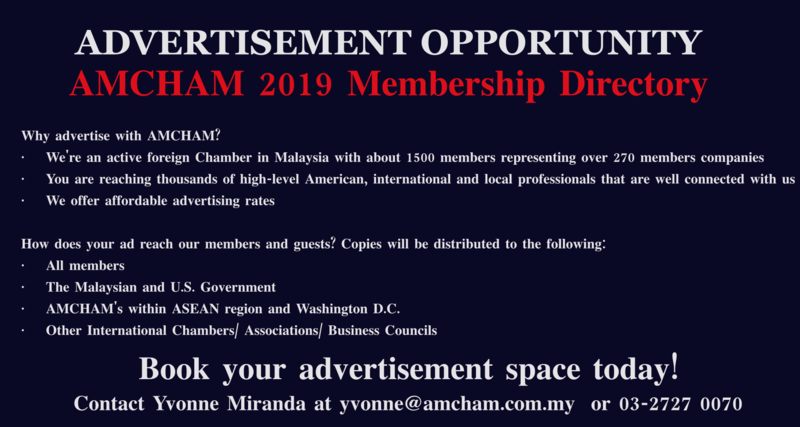 For additional information on AMCHAM membership, please contact the Executive Office at +603 2283 3407. Please click here to apply online. Our membership team will follow up with any further details required. © Copyright 2019 American Malaysian Chamber of Commerce.